An abdominal ultrasound is a test that allows your doctor to look at what is going on inside your abdomen (often referred to as your stomach or belly) without surgery. The abdomen is the part of your body that contains your stomach, large and small intestines, pancreas, liver, and gallbladder. It contains blood vessels, including the main artery that supplies blood from your heart (aorta), the large vein that carries blood to your heart (inferior vena cava) and all of its branches, as well as muscles, and your spine. An abdominal ultrasound is safe and may cause only mild discomfort. The test is performed on people of all ages. A trained medical technician moves a handheld device (called a wand) across your belly. The wand is connected to an ultrasound machine. As the technician moves the wand across your belly, it produces high-frequency sound waves. Those sound waves create real-time images and video of the inside of your belly. The images look similar to an X-ray. However, ultrasound picks up things that aren’t seen by an X-ray. Abdominal ultrasounds are performed on people who have unexplained abdominal pain or have had abdominal injuries. When you arrive for your ultrasound, you will be asked to undress and put on a light gown. You’ll lie on your back next to the ultrasound machine. A technician will squirt a clear gel onto your abdomen and spread it around using the wand. The technician will watch the images as they appear on a nearby monitor. He or she will record the images for the doctor to review. The test typically takes less than 30 minutes to complete. You will not get results from the technician. He or she will send the images to your doctor to review and your doctor’s office will call you with the results. 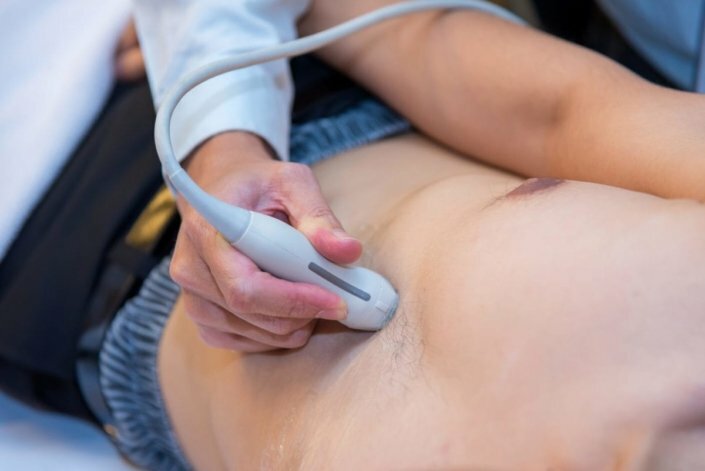 An abdominal ultrasound is one of the primary tests used to find an abdominal aortic aneurysm. This is a condition that causes your abdominal aorta (the artery that supplies blood to the lower part of your body) to bulge. On rare occasions, the bulge can burst (called an abdominal aortic rupture), which can be very dangerous, even deadly. When it bursts, it causes internal bleeding, which requires immediate medical attention. To locate the cause of a kidney infection. To diagnose and track tumor growth and cancer. To diagnose or treat fluid buildup in your abdomen. To check the swelling of organs inside the abdomen. To examine the damage from an injury to your spleen. To locate kidney or gallbladder stones. To determine the cause of abnormal liver or kidney blood tests. To check for unexplained causes of fever. To guide a biopsy procedure (using a needle to take an sample of a tumor or tissue from your abdomen). Your doctor will do a thorough office exam before deciding if you should have an abdominal ultrasound. Ultrasounds do not expose you to radiation. You may have some mild discomfort as the wand is moved over the area of your abdominal pain. An abdominal ultrasound is less effective on people who are severely obese. Excess fat and tissue blocks the technician’s view of organs and arteries. If your doctor recommends an abdominal ultrasound for your liver, gallbladder, spleen, or pancreas, eating a fatty meal before the test will limit the technician’s view of those organs. Why would my doctor choose an abdominal ultrasound over an X-ray or a CT scan? Will an abdominal ultrasound expose my insides to anything harmful? If the technician finds that I have excess air inside my stomach or organs, will I be asked to return at another time? Can this be done in my doctor’s office?